In the competitive world of antenna systems, each company approaches a new customer's requirement empathizing particular abilities. Ingenuity is often the order of business. AFC's prime customers demand the same resourcefulness. In order to meet special requirements, AFC takes advantage of its tools, molds and manufacturing techniques. Examples are many. Improving tracking systems are important for telemetry, satellite communications and shipboard applications. 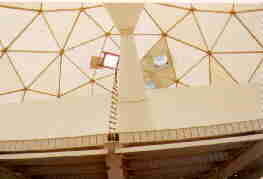 Radomes improve tracking systems by removing random and often large dynamic wind pressures. 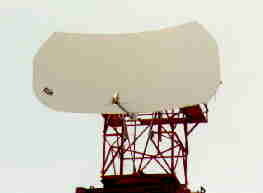 In the absence of wind pressure, undersized pedestals may be used to reduce antenna system cost. An optimum undersized pedestal, in tern, leads to ultra light cored reflectors. Ultra light cored reflectors are 40 percent lighter than the weight of standard composite reflectors. Antenna feed designers are often faced with peculiar specifications. Solutions to such problems as wide bandwidth and low side lobe level appear as special focal length requirements or as special offset or reflector shapes. Tactical antennas, on the other hand, are assembled and disassembled many times under various time pressures and weather conditions. 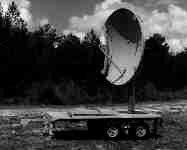 Such situations invoke creative paneled antenna reflectors together with reusable racks. For immediate erection transportables, foldable panels are hinged at appropriate points. AFC's standard antenna mold sizes through 7 meters diameter, with increasing focal length dimensions, enable improvising and versatility. Mold sections are blocked-off or paneled for specific focal length or reflector shape. For accurate assemble, panel sections are predrilled or hinged right on the mold. Deicing requirements are a necessary part of many antenna systems. 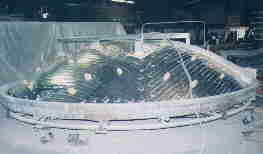 AFC's anti-ice system uses a series of wires embedded next to the reflector surface within a cored reflector. 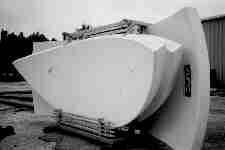 Several inches of thermal insulation follow directing the heat toward the reflector front surface. Our distributed heating wire approach is electric current self-regulating. Current automatically decreases as the reflector surface temperature increases. Self-regulation avoids burnout failure common to localized resistance heaters. Since snow and ice collect non-uniformly over the reflector, self-regulating heating wire increases power where the snow and ice accumulates. Such features keep the antenna surface temperature uniform, preventing thermal expansion distortion and the resulting antenna pattern degradation. Of the possible choices between expendable propane type heating, after market backside mounted heaters vs. embedded wire anti-ice, our customers emphasize the utility of AFC's system. With no periodic maintenance and propane replacement, as well as no required field installation even in the dead of winter, electric heating is the clear winner. The AFC anti-icing system consists of a continuous array of self-regulating heat strips encapsulated in the antenna at the time of manufacture. The heaters are covered with Fiberglas insulation and enclosed with a thin FRP outer skin. This "sandwich" construction provides insulation, protects the heaters, and strengthens the antenna. The self-regulating heat strips prevent the possibility of uneven heating on the reflector and provide decreased power consumption as the temperature increases. Average heating capacity is 50 watts per square foot. If the control system or the thermostat were to become disabled, the maximum surface temperature reached on the reflector due to heaters is 108 degrees F.
The control system consists of a breaker panel to provide individual circuit protection, an industrial quality thermostat, and an A.C. contactor. The thermostat operates the contactor, providing power through the circuit breaker to the heater. It has been designed to give dependable service, and to provide easy trouble-shooting in the unlikely event of a failure. The control system is mounted inside a weatherproof enclosure attached directly to the back of the reflector. The incoming service should be stubbed up at the front of the foundation, and include a raintight disconnect. Installation consists of running the power leads in liquidtight conduit to the control box and wiring in to the top of the contactor. Three power options are available. The standard system operates at 208-230 VAC 3-phase. It is the most economical system to install and operate. An optional 220-240 VAC single phase system is available, but must be requested at the time of order. The third option, available on 1.8, 2.4 and 3 meter reflectors only, is a 110-120 VAC system. All systems are 50 or 60 Hz where applicable. The self-regulating heat elements are typically turned on at about 40 degrees F. For the first 2 to 4 minutes the current draw is very large. The following service requirements are the minimum required to sustain the turn on amp draw. They are not representative of the steady state current demand, which will be much smaller (often a factor of 10 smaller). A site index of other AFC WWW documents related to antennas and other AFC products may be found in Antennas for Communications (AFC) Home Page Document Summary List.